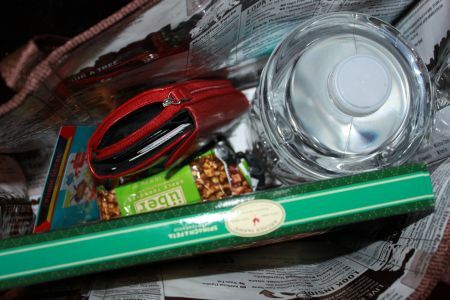 It has been years since I did away with plastic bags for good and finding a good heavy duty bag took trial and error. I also realized that spending a little more will save you a lot more money down the line. I bought a $45 bag that has lasted me over 5 years now and it barely has a snag. It is super heavy duty and has ran the gamut of weight tests. It even carries a gallon of water and groceries just dandily. I love it and could not have had a better bag until now. The bag i'm about to review is all those things, but much more aesthetically pleasing. The Terracycle Bear Naked reusable bag is made of nothing but canvas sewn into the plastic bags we eat from. It is just as durable as the one described above, but has an awesome design. 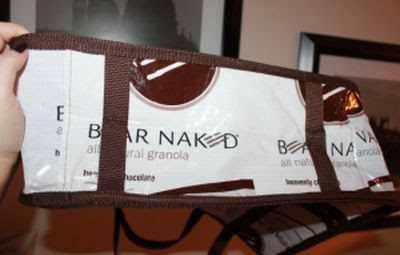 Bear Naked also happens to be one of my favorite granola companies, so I can proudly sport it and support a company I really like. Plus, it's all about chocolate and anything chocolate I pretty much love by default. I tested this baby out the first day I got it and it held much more than my original bag. It's much bigger than the other one. This is great for loading up on produce and I actually went overboard, because it fit so much that I had to use two separate bags. It was way too heavy. This was what I got on my last supermarket excursion. A gallon of water, a few fruit bars, some other medium sized things and a pizza. It could have fit two gallons of water with room to spare. The bag is constructed very nicely, with not a missing stitch in sight and after I was done carrying that loaded bag, nothing changed. This thing is going to hold up just as long as the one I have now. It would also be great for regular shopping. It can hold so much! It is comfy. The handles are not too long or short. They're at just the right length so that the weight doesn't put pressure on your back from just hanging there. You really get a good grip of what you're carrying. I love this, but it took some getting used to, because I had messenger back syndrome, where everything would just hang in a bag with a long strap weighing me down. 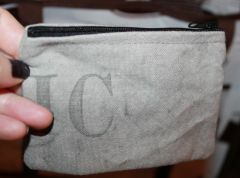 I also received a cute lil coin bag that was made from recycled USPS mail bags. They are made for every weather condition in a forecast, so this should last forever. I highly recommend this unique recycling brand if you're in the market for a reusable bag. It would make an excellent gift to someone who is concerned about the environment and plastic usage, a crafty person, or someone who just wants a good heavy duty bag for groceries. I have no complaints and know that this bag will have a long lifespan. What's funny is that I actually purchased from this brand before and didn't realize until after I requested to review them. I had bought a recycled computer parts picture frame at Target and it is awesome. They have so many unique and interesting products made from everything from computer parts to bike chains! 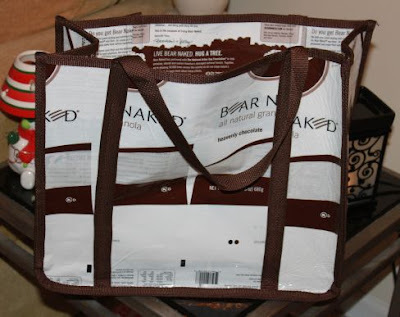 Something else really cool that I found out, is that you can send in your Bear Naked bags along with many other items, such as flip flops, and they will reward you in Terracycle products. I may have to take them up on that. If you'd like to help raise money too, you can do so here. Check out all their neat products and become a fan on facebook for more info and promotions! You can be stylish, not have to break the bank and save the environment while doing so! If I have to buy plastic I recycle as much as possible. Such is the case with my bottle of water. Our landfills are so gross and too many. Help to make them less full and stop using plastic. There is no reason to use it when you shop. Plastic is bad for the animals, plastic is bad for us, bad for our soil, it uses up crude oil to be made, and takes a very long time to degrade. Centuries. Reuse whenever you can and help make our planet a more sustainable place. Even if it's just eliminating a little, you are doing something. 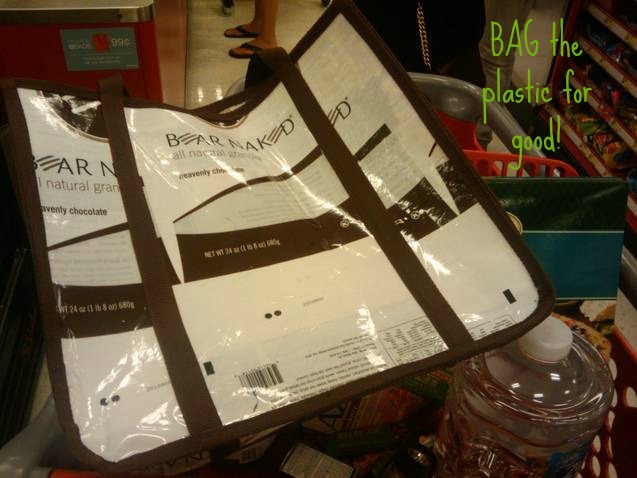 I love reusable totes and bags- lots of grocery stores give you a small discount for using them too...my fav it that coin purse, though! So cute! I love them too! 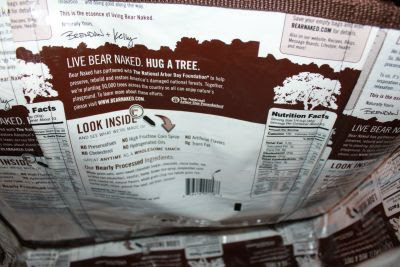 Plus bear naked has a fun name. Those bags are so useful for basically EVERYTHING! The grocery bag is pretty unique, and different, some peoples trash is another persons grocery bag, lol, so that's a cool concept. I love the coin purse too. I have a terracyle bag! I love mine!